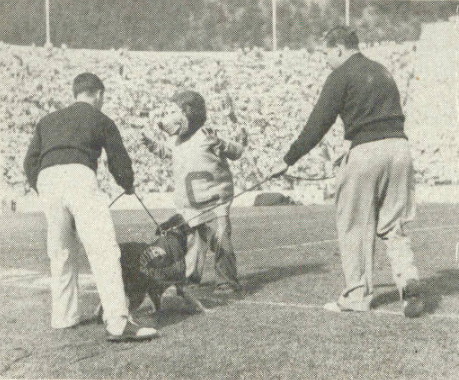 Here is George Tirebiter, being restrained in 1947, from attacking Oski, the Cal mascot at the USC-Cal game in Memorial Stadium. Question: Why was George restrained? PLEASE, the statue awaits. Hecuba rises in the ashes of the confederacy. Just as Hillary aka ‘la bruja’ has in the trashcan of the comintern…. I know the Cal mascot costume looks shabby but I had no idea they’ve been using the same one since the 40s. It must smell horrible. Patchouli oil maintains its Berkley charm. How long before the budget axe swingeth for Oski? You’d have to restrain me too. God, country, and the Tirebiter! Speaking of mascots, is Traveler truly named after Robert E. Lee’s horse? Oh goodness no. That was a gray horse. Ours is pure white. How politically incorrect is that? A gray American Saddle bred of 16 hands, known for speed, strength, and courage in combat. A historical American Tea Party Legend. Richard Saukko, who for 28 years rode the familiar white horse Traveler at USC football games, has died in Sepulveda. The cause of death was not immediately known. He was 72. Saukko made his first appearance on Traveler I in 1961, wearing a costume worn by Charlton Heston in the movie “Ben-Hur.” That costume proved to be too heavy, though, and Saukko made his own distinctive leather outfit, modeled after the one depicted on the Tommy Trojan statue on USC’s campus. Saukko rode at almost 200 football games over 28 years, until his retirement in 1988. He began the custom of riding around the Coliseum track after each Trojan score. Saukko’s first horse was half Arabian, half Tennessee walker and was named Traveler I, after the horse of Civil War general Robert E. Lee. The Tirebiter gave it his all when chasing cars around campus. And he was the 12th man on the sidelines of the games. Look, Cal actually had fans in the stands that day ! Cal was 9-1 that year, the only loss being to SC that day 39-14. SC went on to lose the ’48 Rose Bowl to Michigan, 49-7. Ouch. Scotty, remember when UCLA dog-napped George and shaved U-C-L-A into his hind quarters??? then dropped him off at the local police Dept unharmed but in a “doped up stupor”???? when are you going to wax nostalgic about THAT?? I think that’s tirebiter 2. There were a few as I recall. This picture shows a larger dog than the original. Nope I’m wrong this the original according the internet.